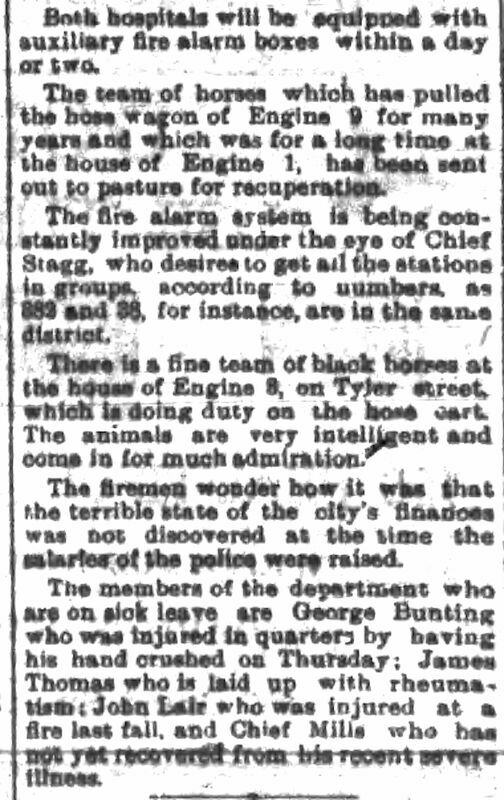 February 1900: The Fire Alarm System was moved to City Hall from the Bridge Street Hose Station and thereby greatly improved. 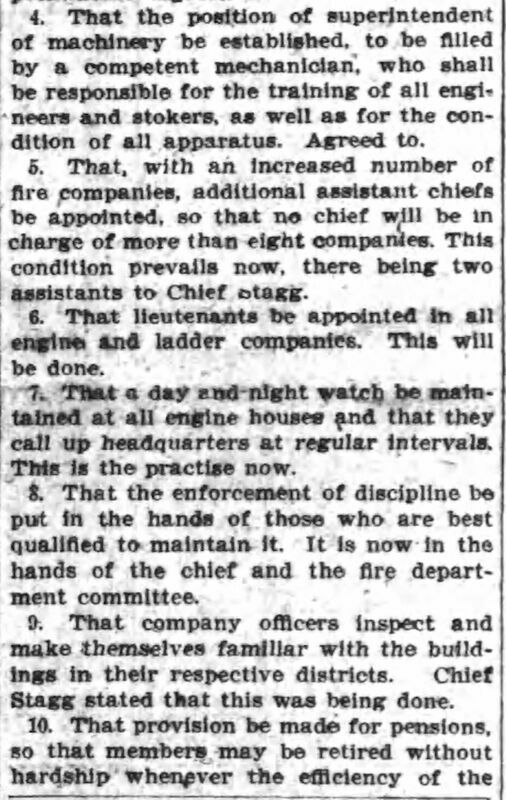 April 1, 1901: Chief's annual report prophetically advises that no new apparatus had been purchased since 1891 and engines in service were from 10 to 20 years on steady duty. 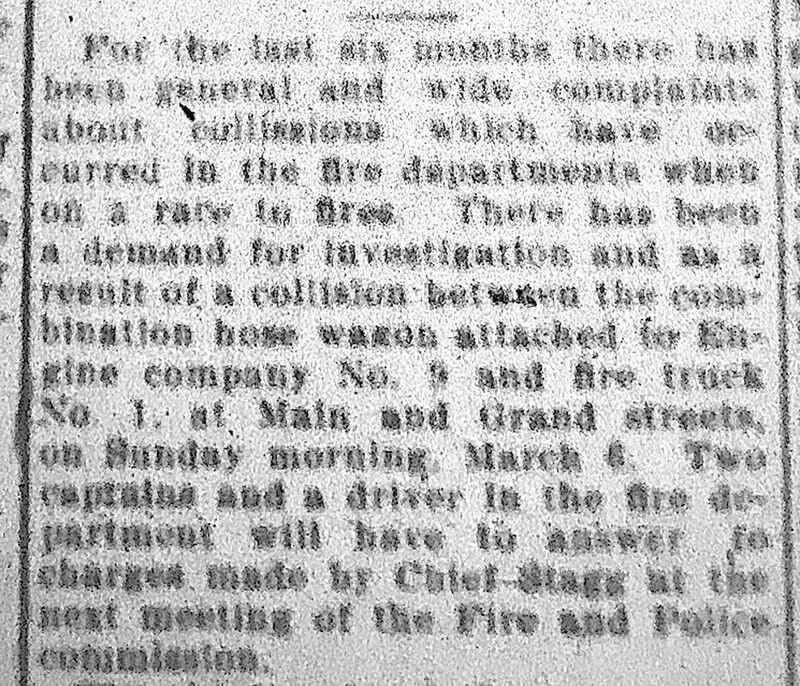 Hose wagons were from 10-16 years old. 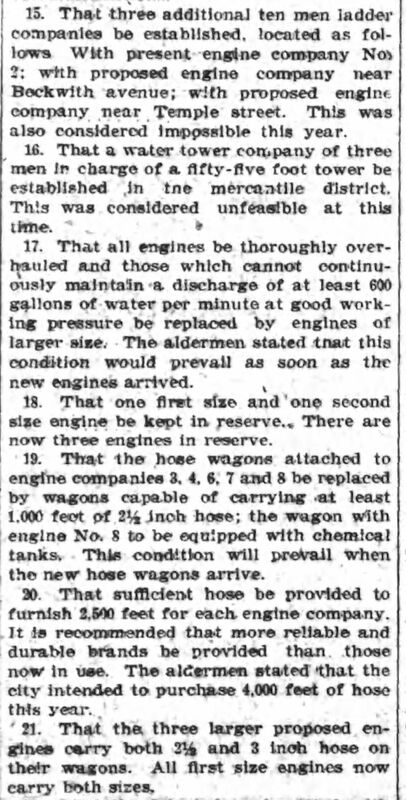 He advised immediate purchase of two second class engines and two combination hose wagons. 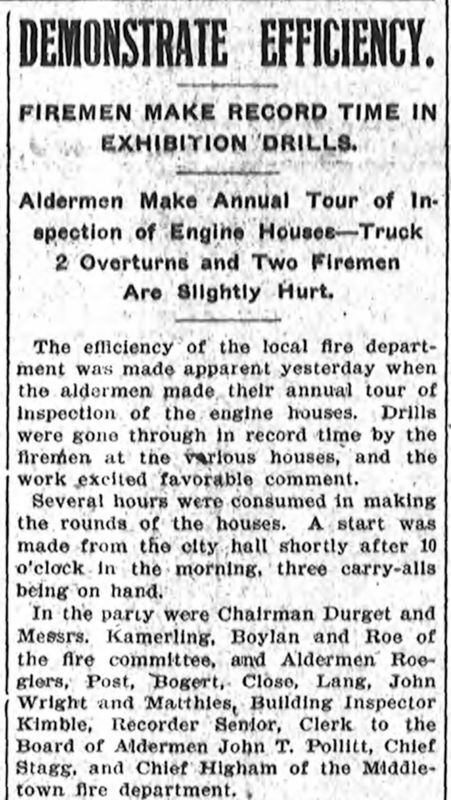 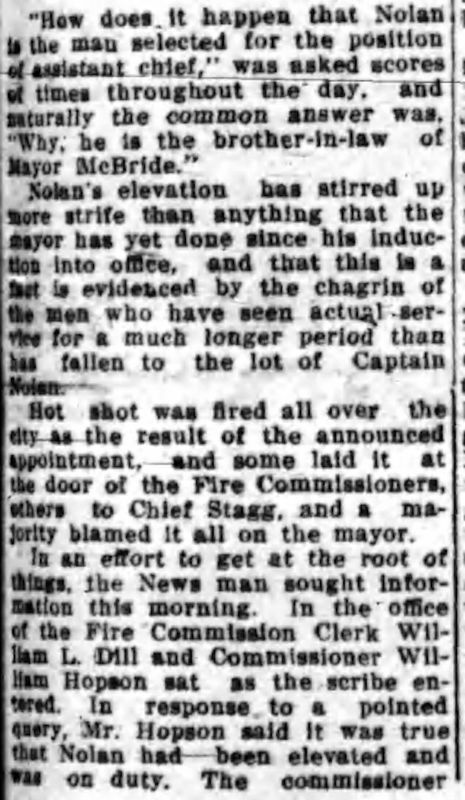 May 17, 1901: Firehouse Inspections by aldermen and Chief Stagg: companies observed as they "hitched up"
On June 21, 1901, fireworks exploded in a shop in a four-story tenement at 440 Main Street killing 17 people and trapping tenants in apartments above. 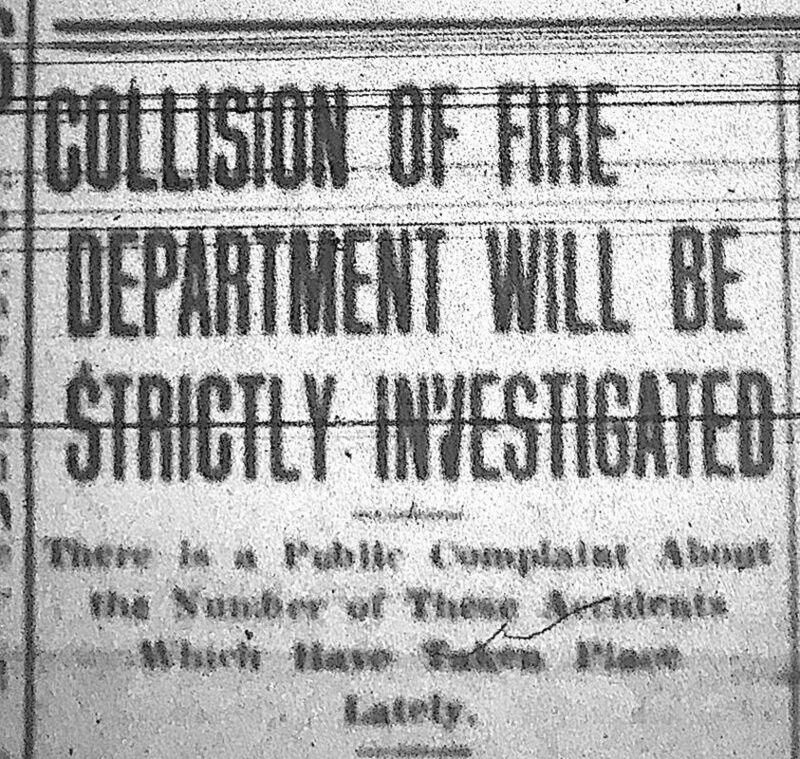 Three firefighters were injured. 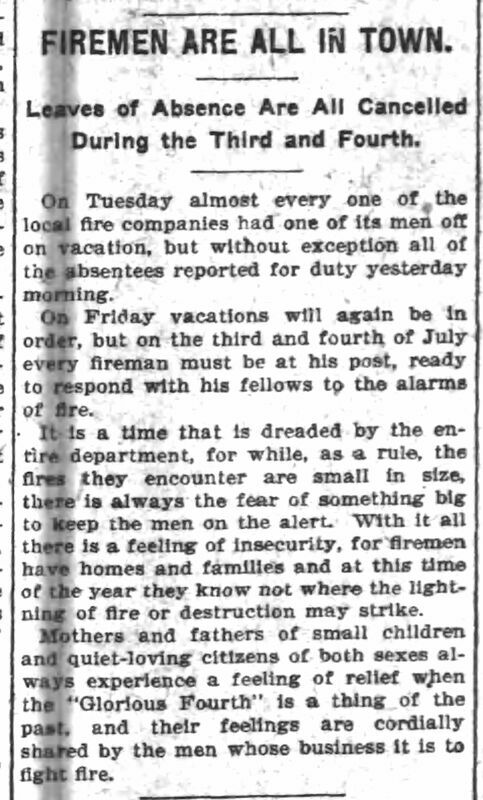 Rescuers used ladders and life nets to save people ``hanging from the windows ready to drop'' when the engines arrived, according to The New York Times. 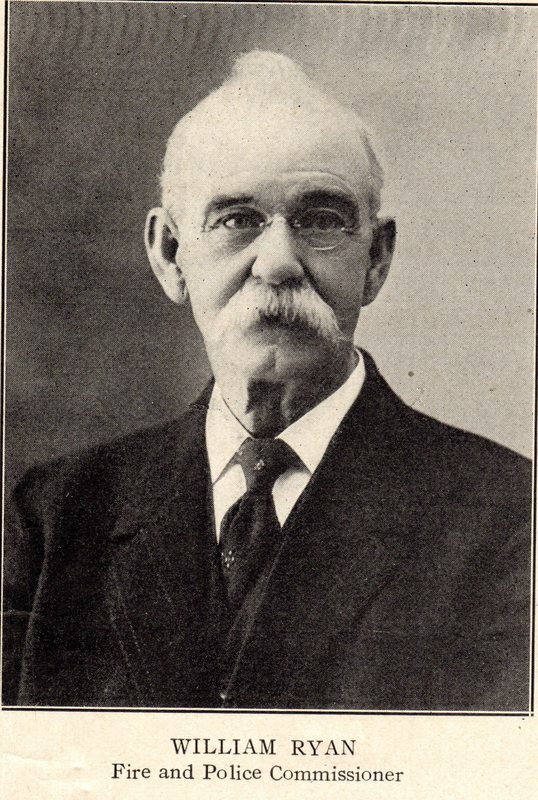 McGlone climbed out of the front window and hung on with one hand while he held his wife to his breast with the other. 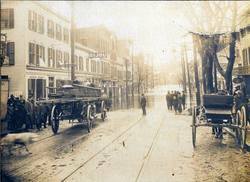 The ladders were all busy, and one of the life nets from Truck 1 was called into use. 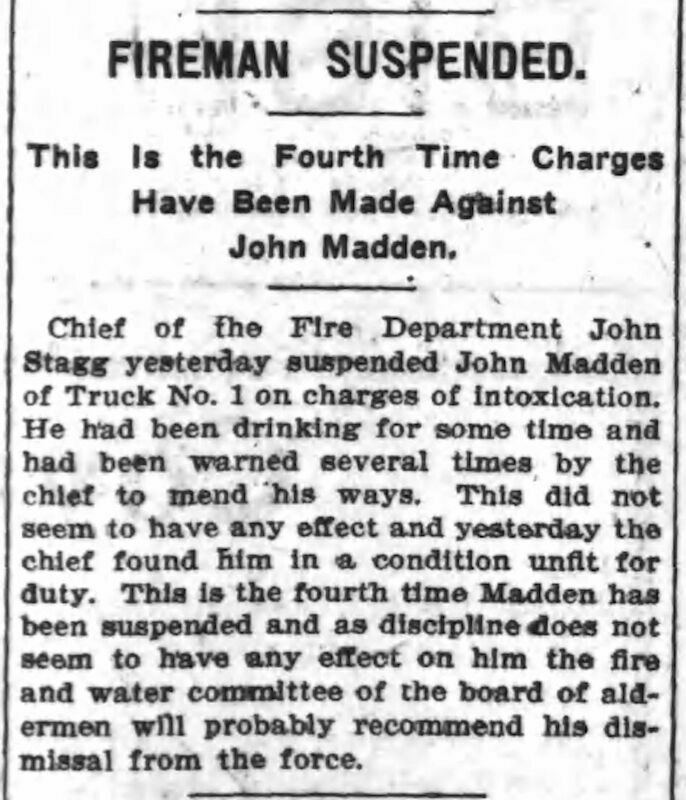 Twenty men held it, and McGlone was told to drop. 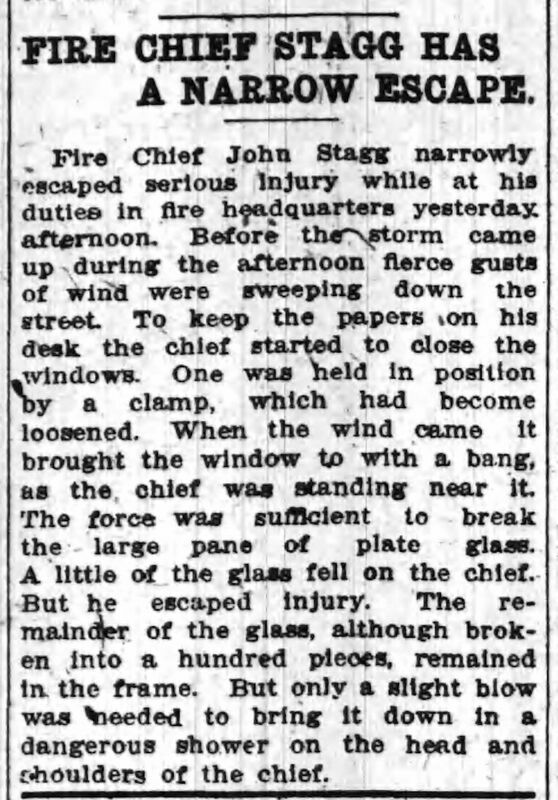 "With a superb show of strength he swung so as to carry his wife away from the building and then let go of her. 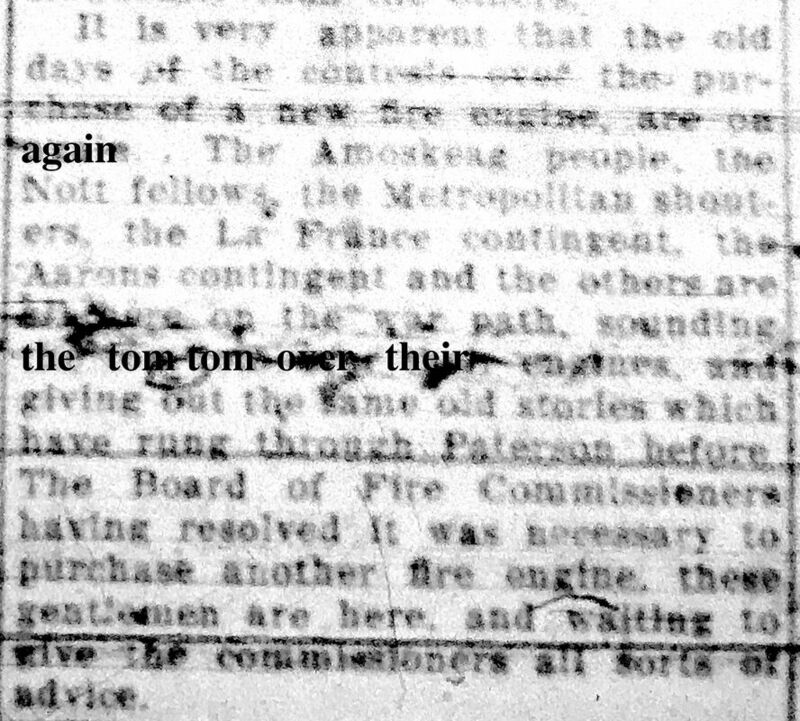 She dropped into the net through the flame. 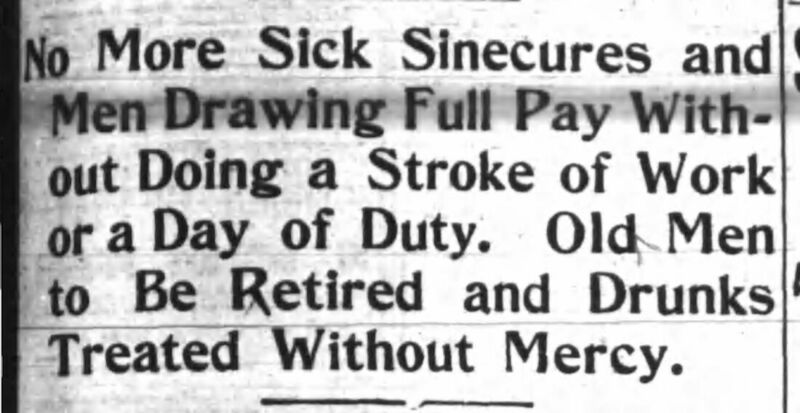 As soon as she could be rolled out Of the net, it was placed for her husband, and he, too, landed safely in it. 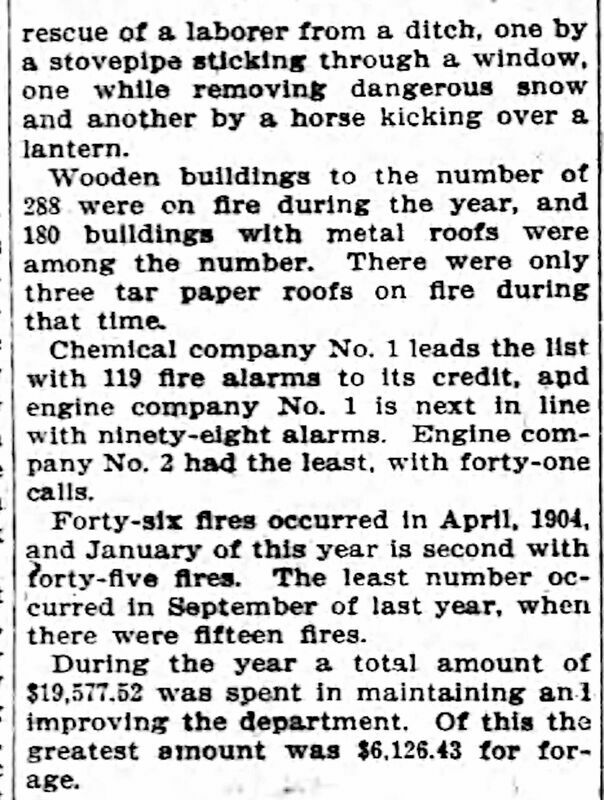 Still, the husband and wife were "badly burned by their flight through the flames bursting from the windows below,'' according to the newspaper. 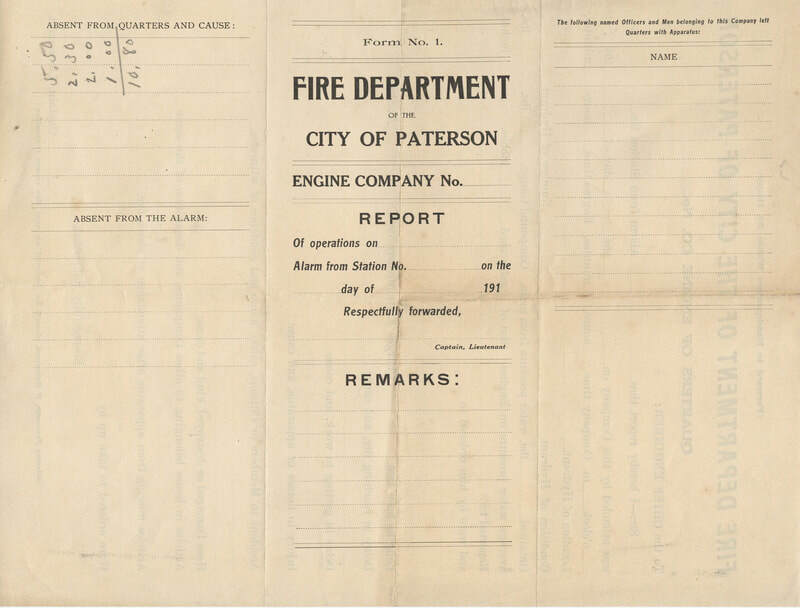 February 8-9 1902: The Great Paterson Conflagration: the largest fire in Paterson's and New Jersey History. 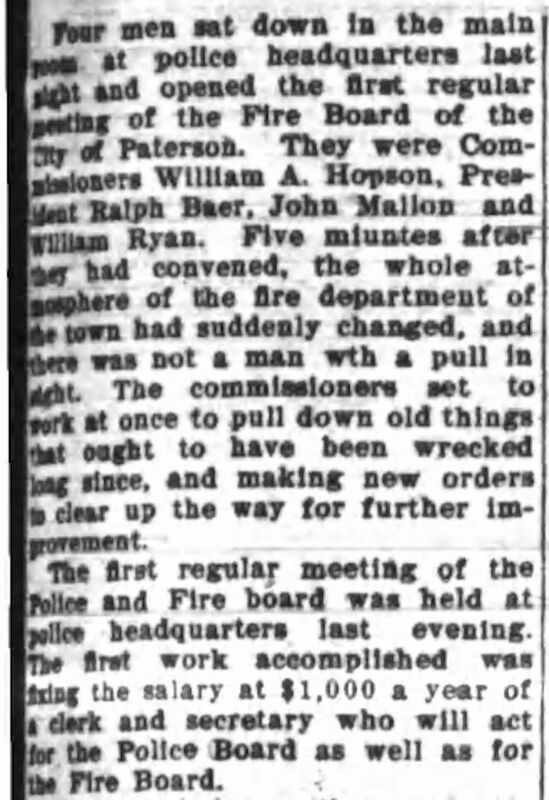 1903: March - The great Paterson Flood. 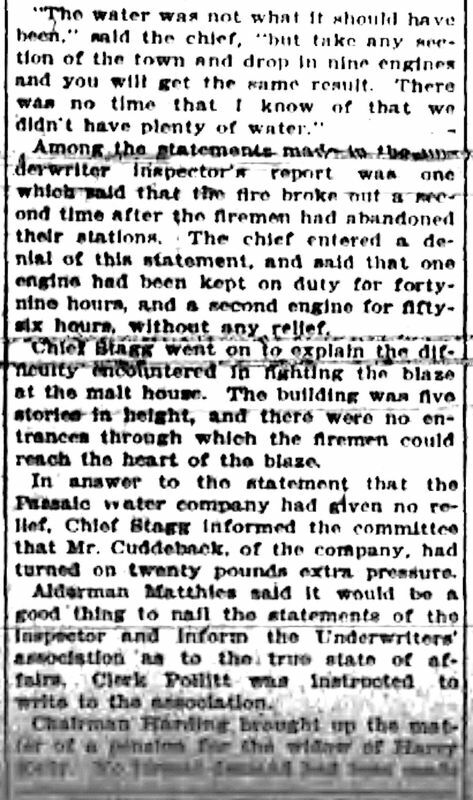 There was a fire in a submerged district. 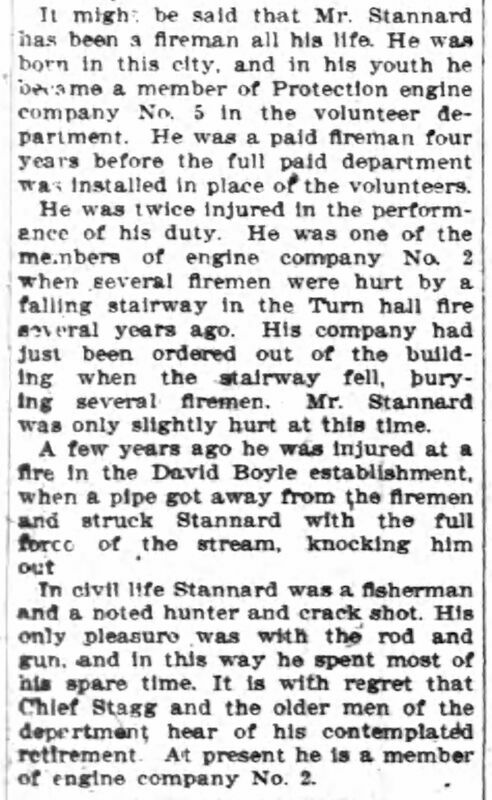 To reach the fire, firemen had to drag the hose for several blocks through waist deep water which was a swift current. 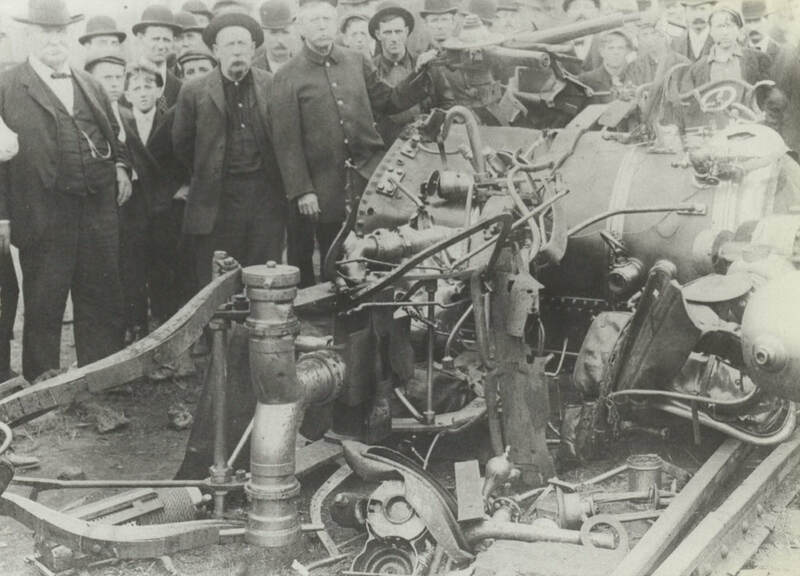 Engine 8 took suction from flood water in the street. 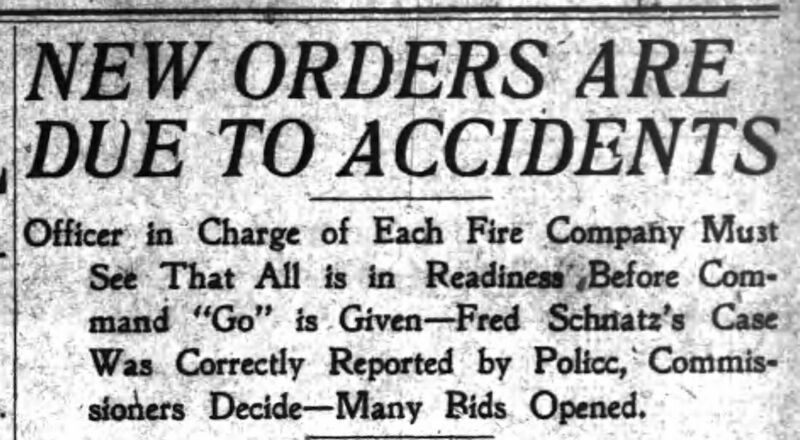 Trucks 1, 2 and 3 were called out to aid in relief of people cut off by rush of waters and many daring rescues were made. 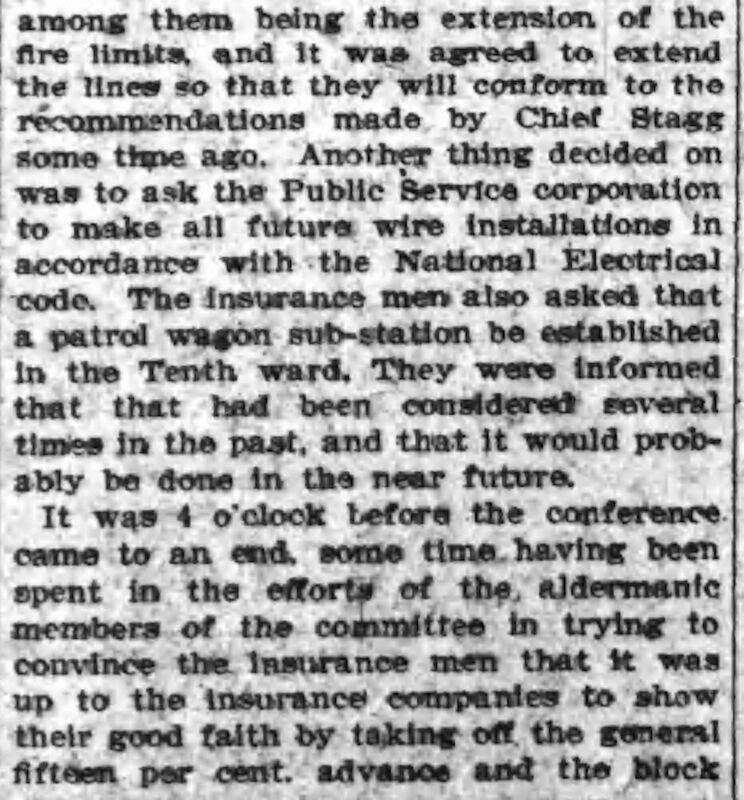 Over 50 persons were taken from homes by means of ropes and breeches buoys and carried over roofs of buildings several blocks from point of service. 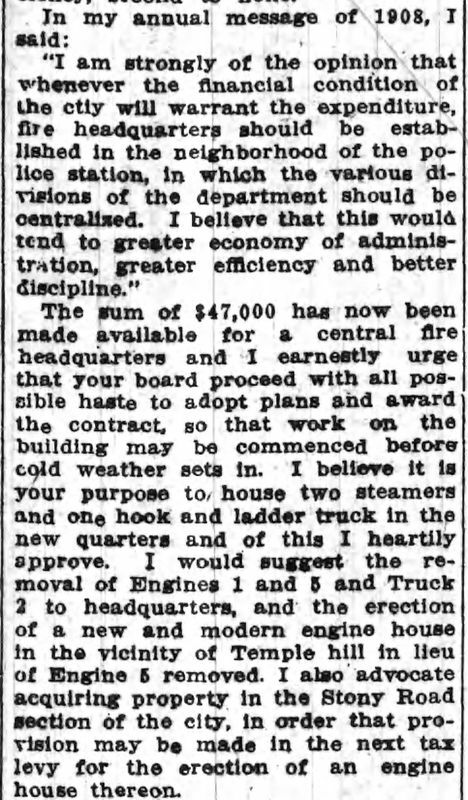 1903: New 75' Seagrave Aerial arrived or Truck 2. 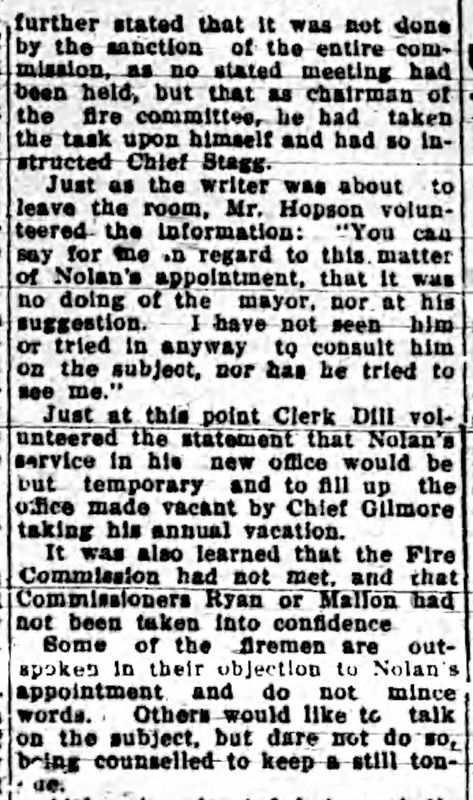 1903: Fire Headquarters Office with Chief Stagg and the Fire Alarm Office move to the rebuilt City Hall on Market Street. 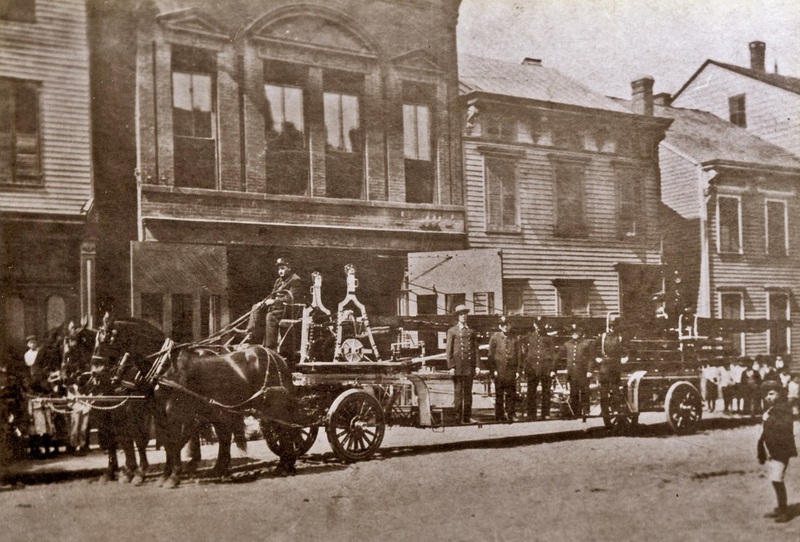 Superintendent of Fire Alarm John Zeluff is shown in the photo below standing at left with straw hat. 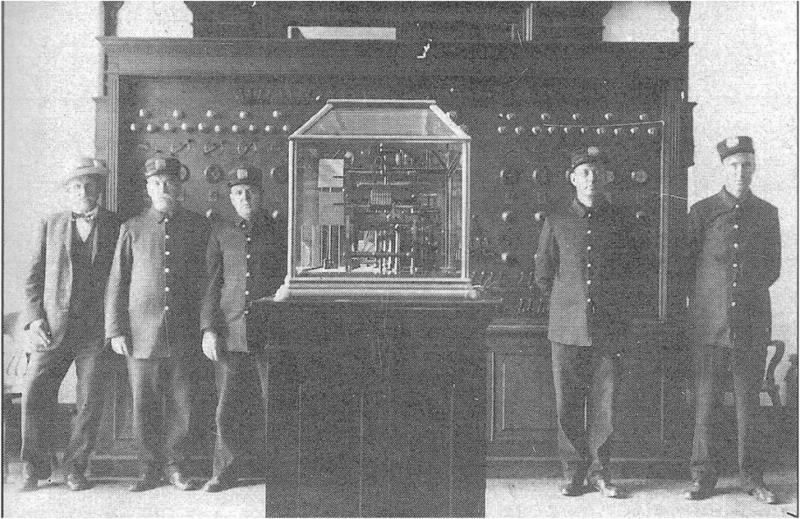 Lineman James Curry is at right. 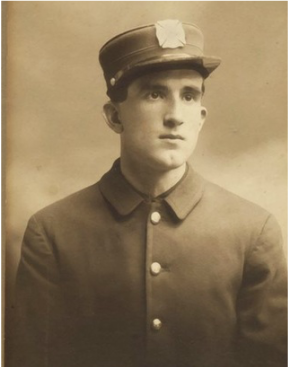 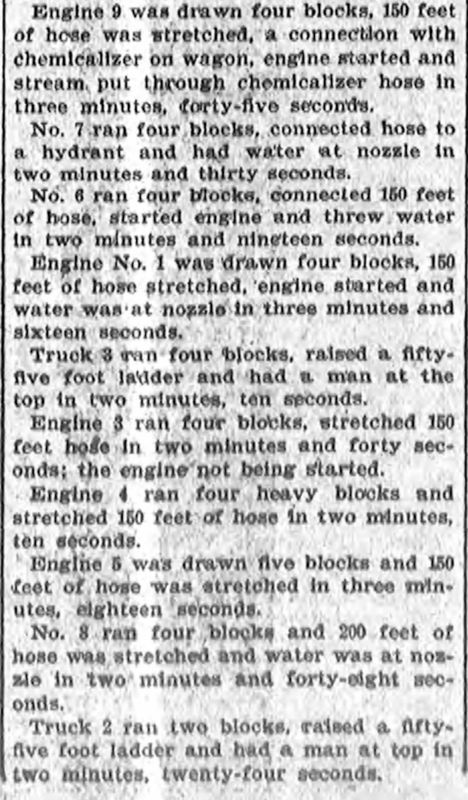 January 15, 1904: Fireman Harry Kelley of Engine Company 7 is killed in a fall from a broken ladder at the Hincliffe Brewery Fire. 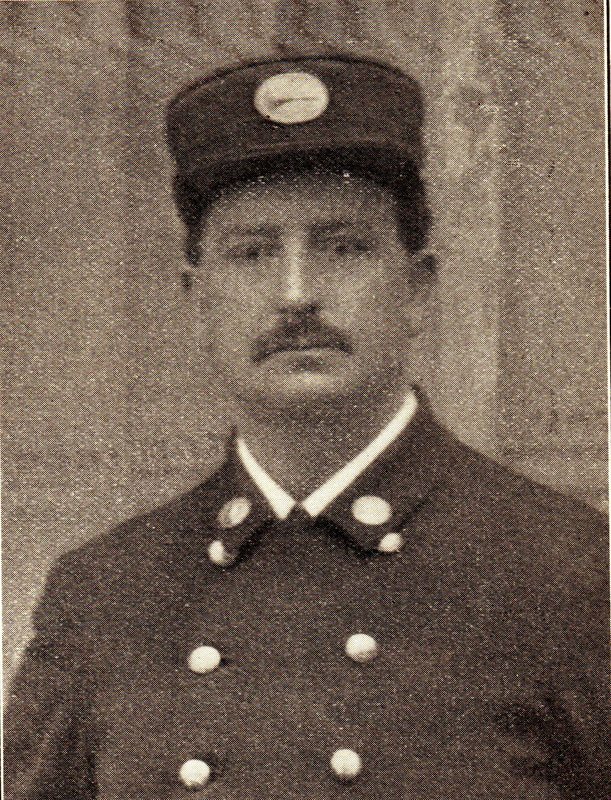 He is credited as being the first paid Paterson Fireman to make the Supreme Sacrifice. 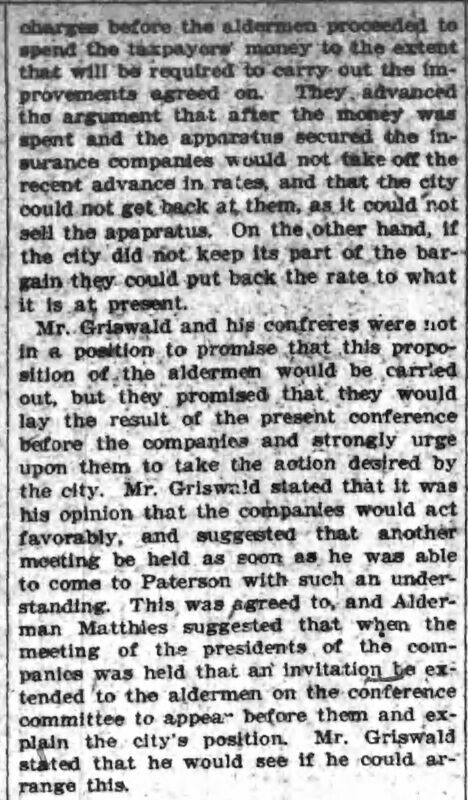 January 30, 1904: Kelly Death & Pension at Brewery discussed. 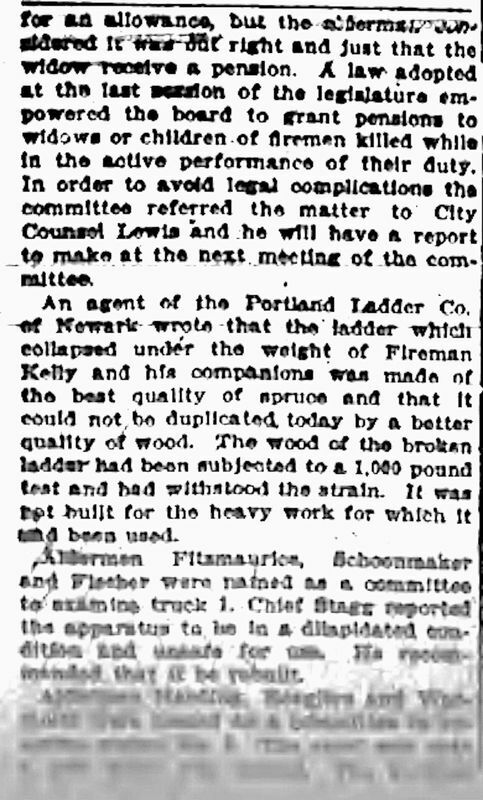 Portland Ladder Company defends the ladder that broke. 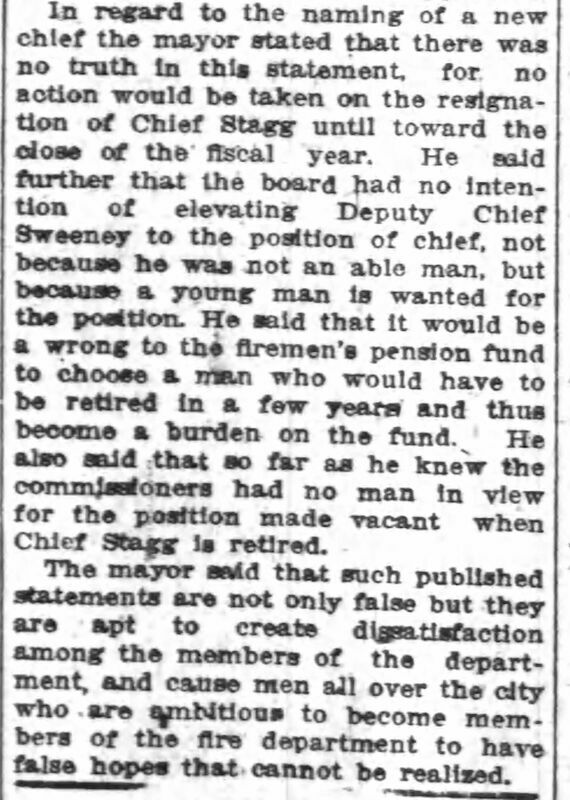 April 4, 1904: Chief Stagg in annual report called attention to the officers and members who risked their lives and health from dangerous positions in the flooded districts of the City in October 1903. 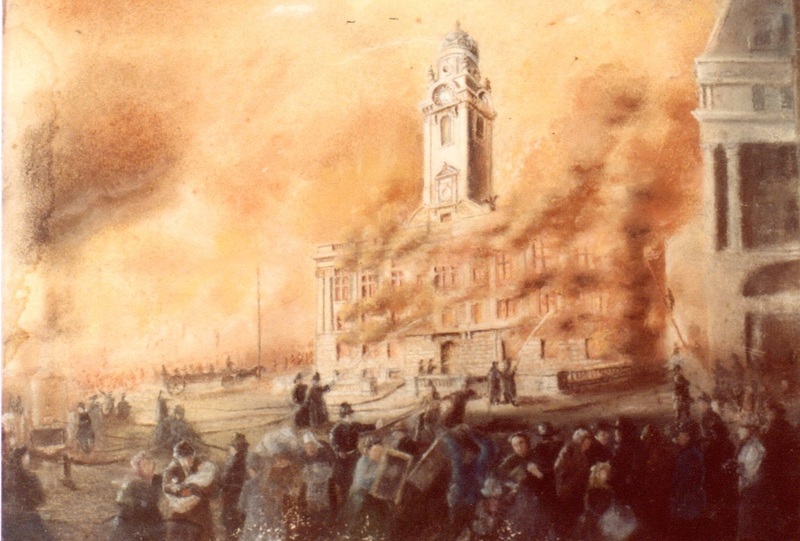 Over 50 persons were taken from their homes by means of ropes and breeches buoys and carried over the roofs of buildings several blocks from the point of rescue. 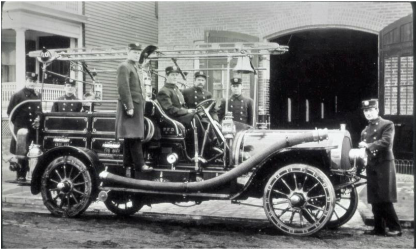 1904: Two additional First Size Metropolitan Steam Fire Engines were purchased for Engine Companies 5 and 9. 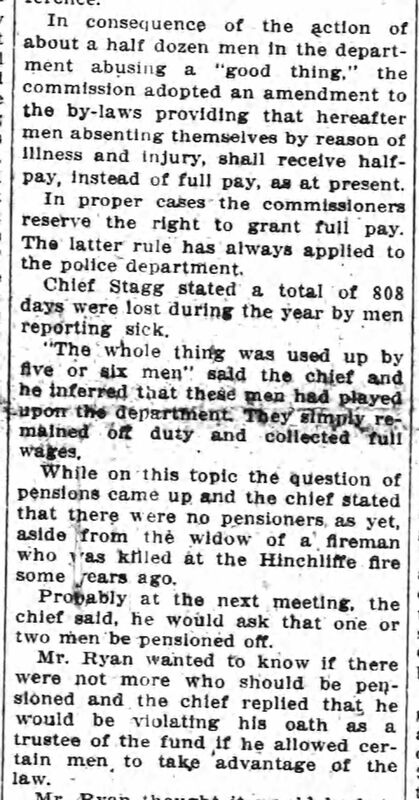 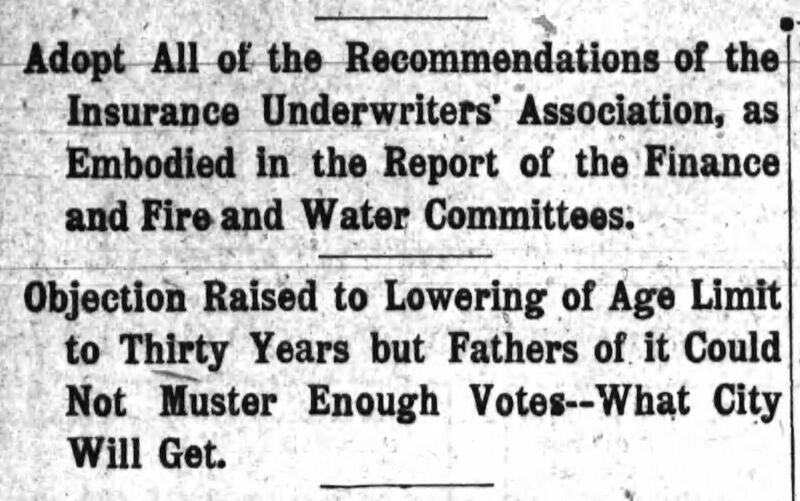 1905: Mew Jersey legislature passed a new Pension Law Fund, making it lawful for department members to associate and maintain a pension fund for firemen, their widows, dependent parents and children. 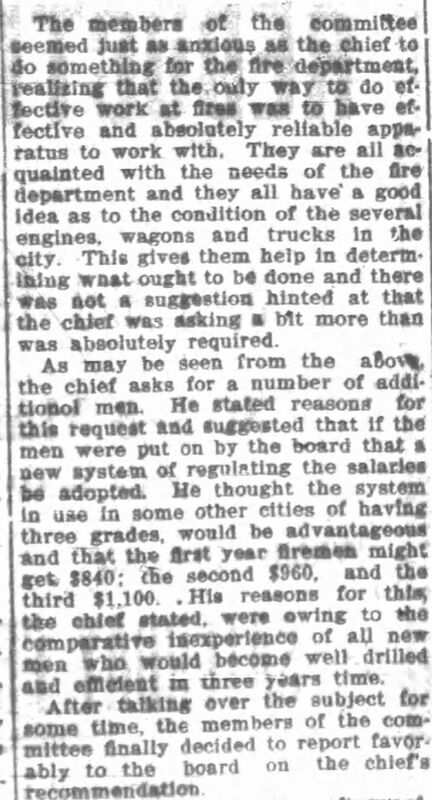 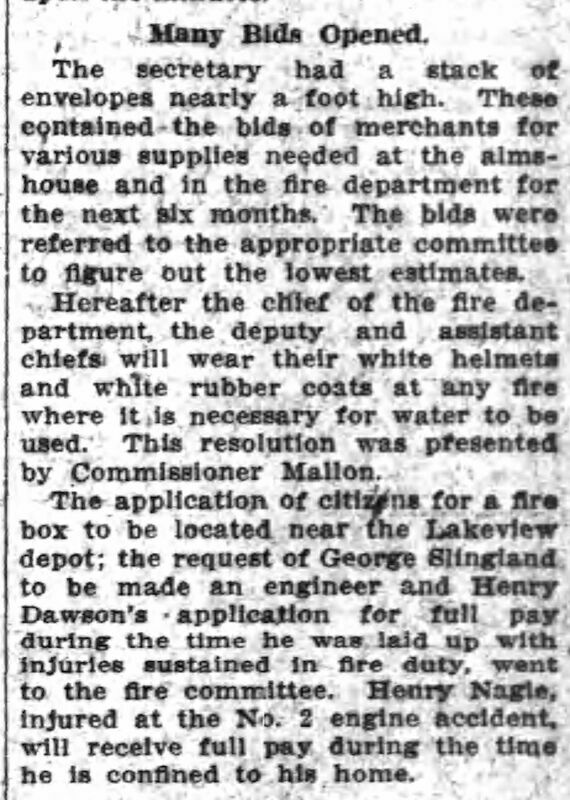 February 25, 1905: Aldermen propose to make major PFD changes - many of which never happened. 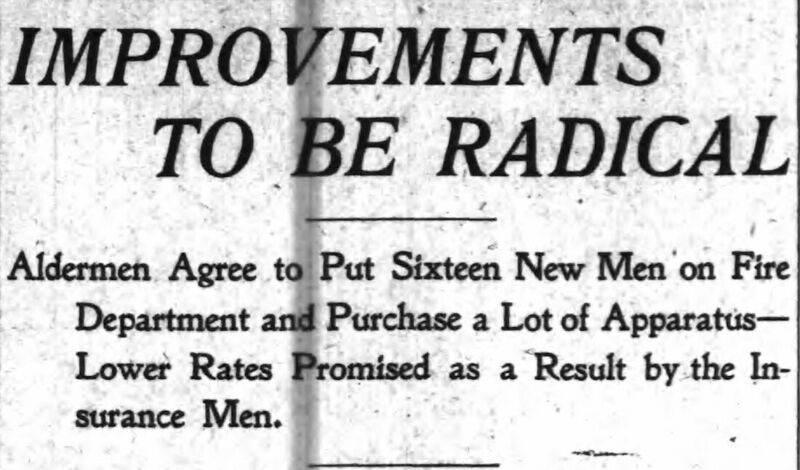 November 5, 1905: The positions of Master Mechanic and Master Carpenter were established with the rank of Lieutenant. 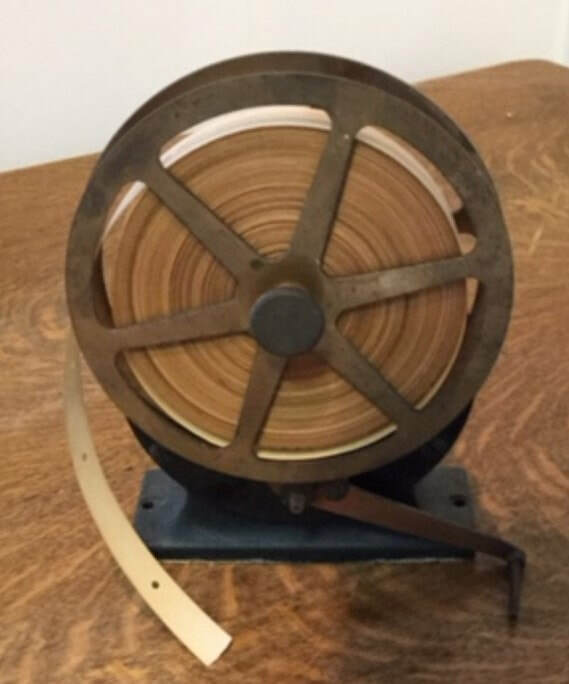 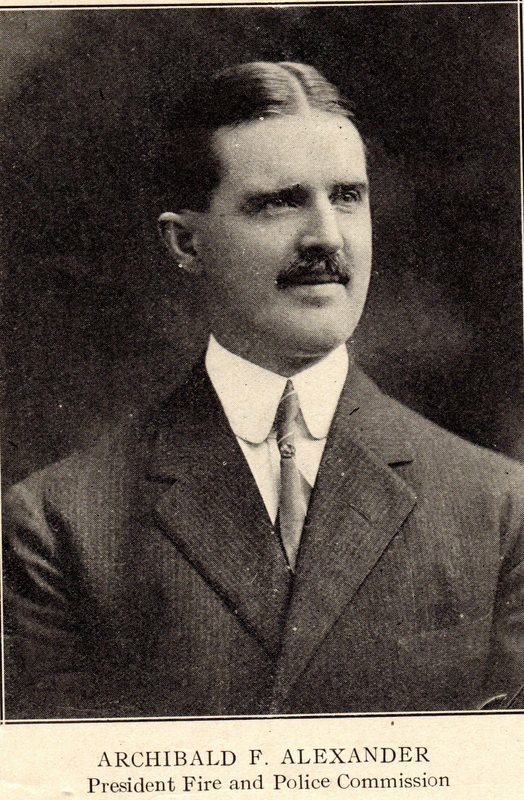 The first MM was William H Ward and MC was John Crotty. 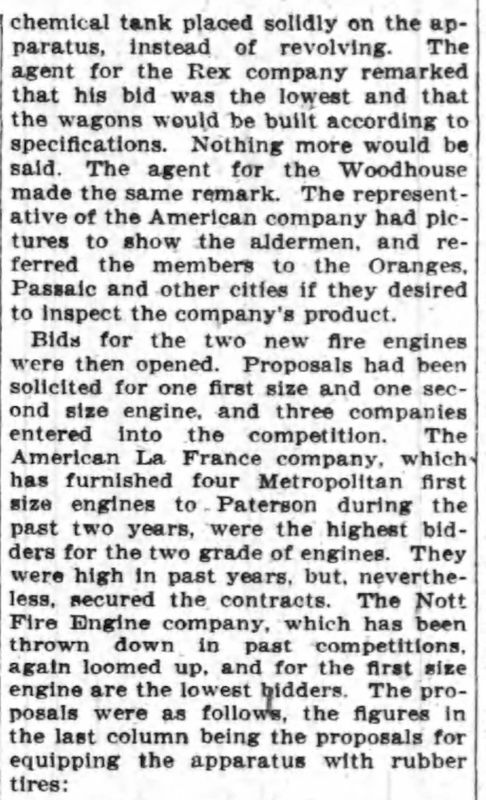 December 12, 1905: Two new First Size Nott Steam Fire Engines were assigned to Engine Companies 4 and 8. 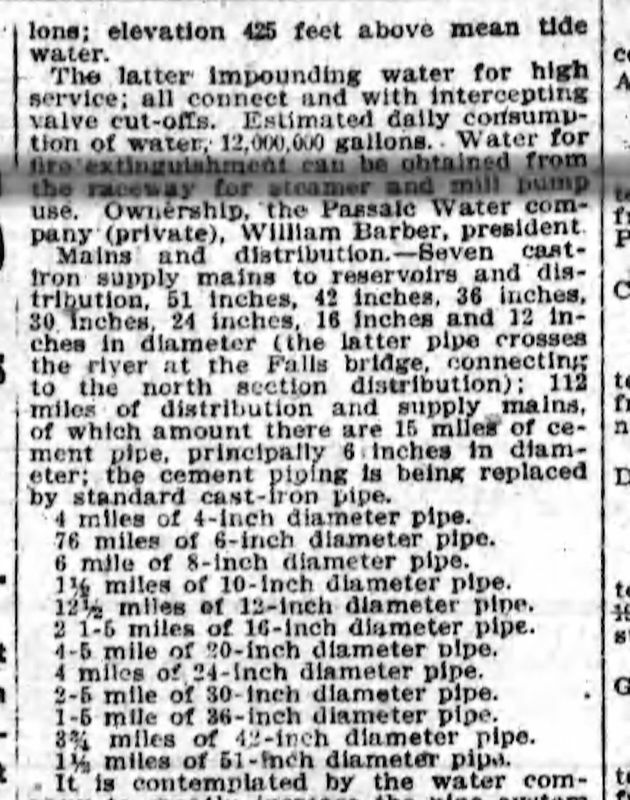 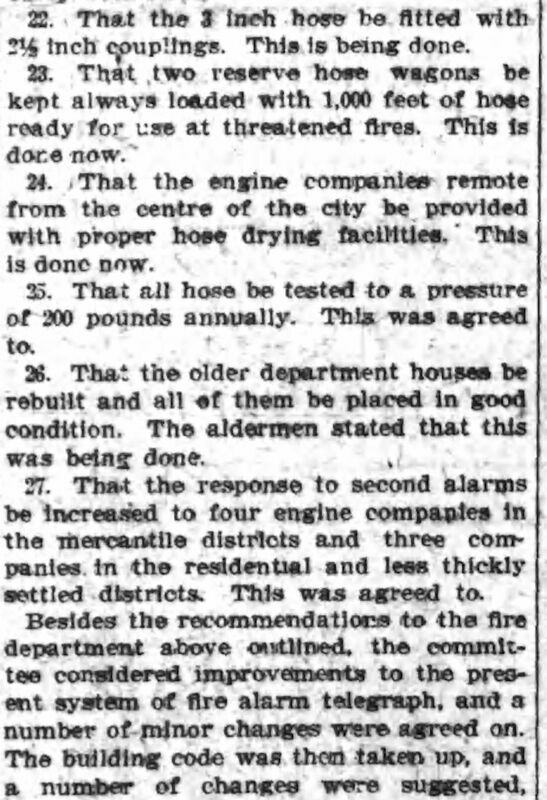 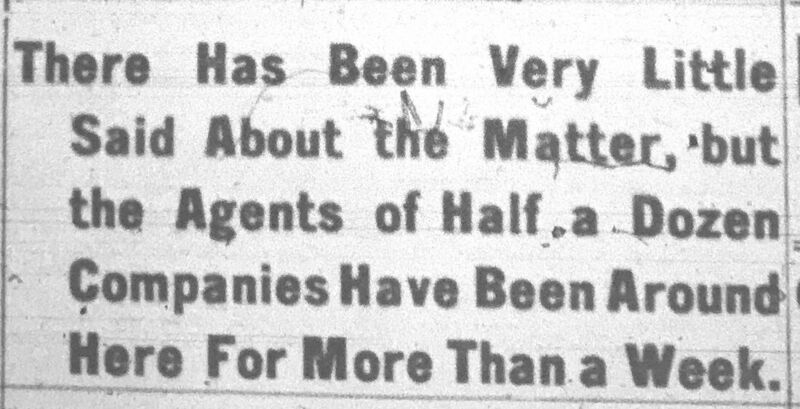 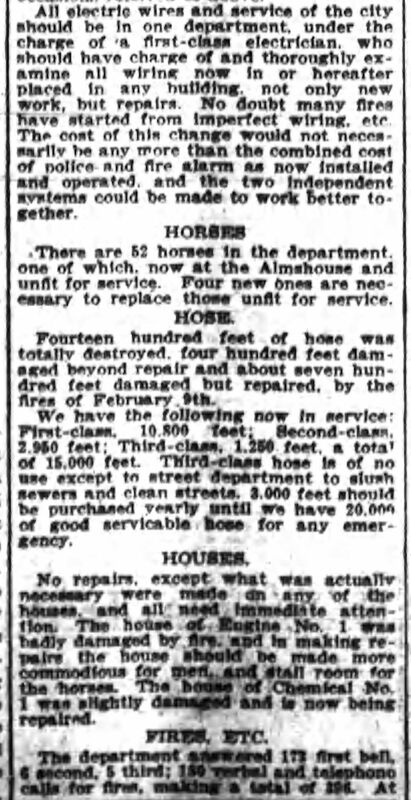 April 1906: Size of hydrant connections increased from 4 to 6inches within the fire districts - there were now 1098 single, 162 two-way and 36 3-way hydrants. 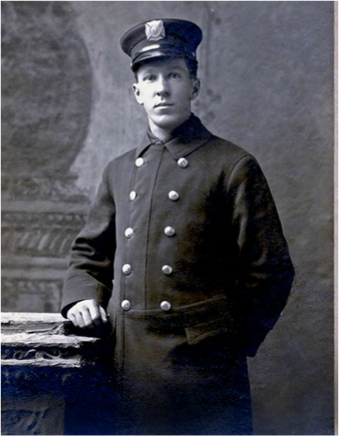 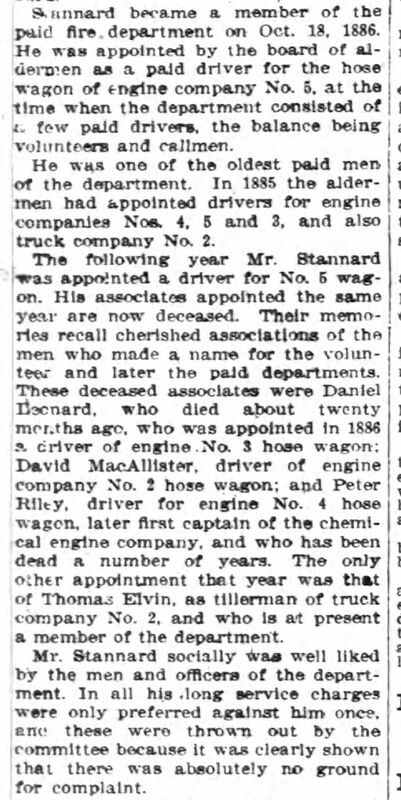 February 10, 1907: First PFD Pensioner - FF William Stannard - Was the first driver of Engine 5 Hose wagon hired in 1896. 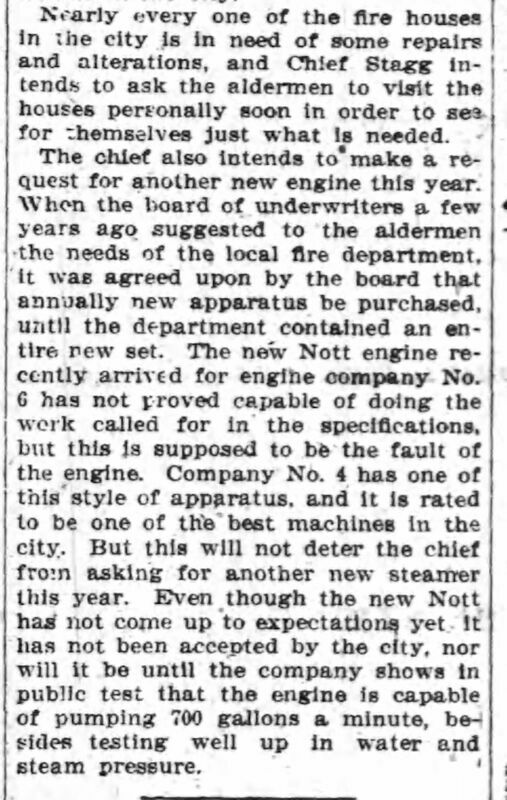 February 28, 1907: A new second size Nott Steam Fire Engine was assigned to Engine Company 6. 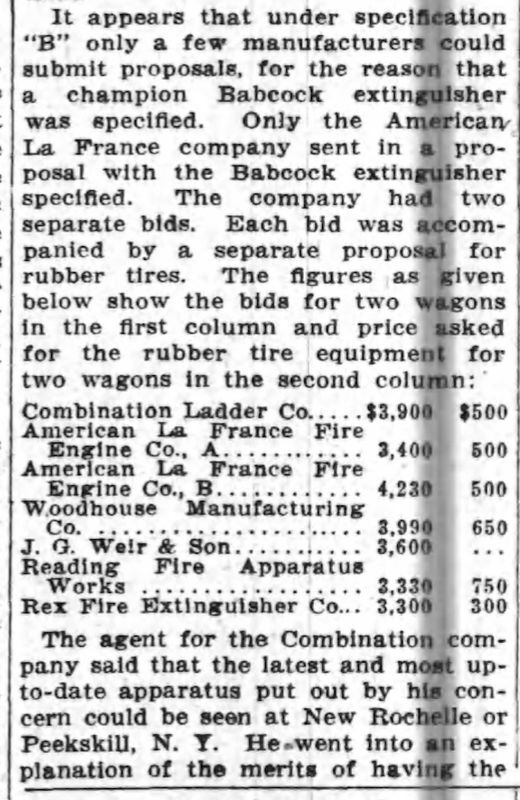 Truck 3 combination chemical/ladder rebuilt and made to be drawn by three horses. 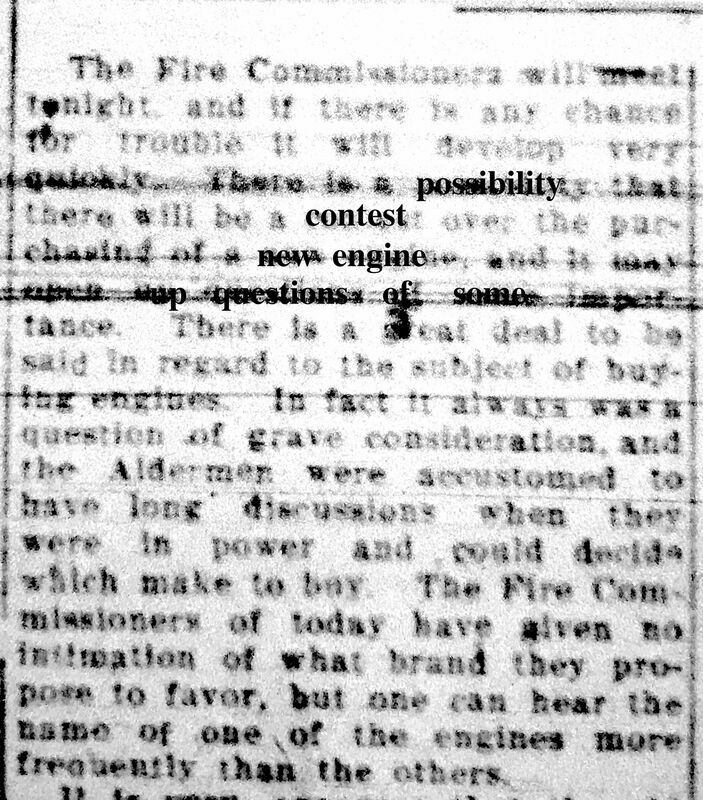 ​1907: Control of the Fire and Police Departments passes from the Board of Alderman to the newly created Board of Police and Fire Commissioners. 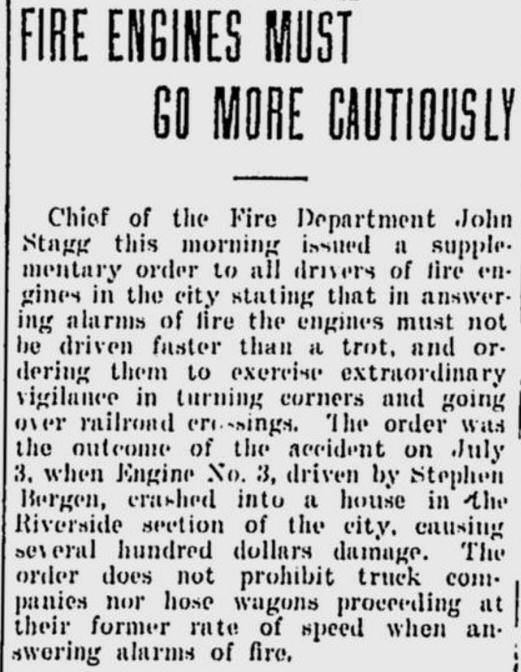 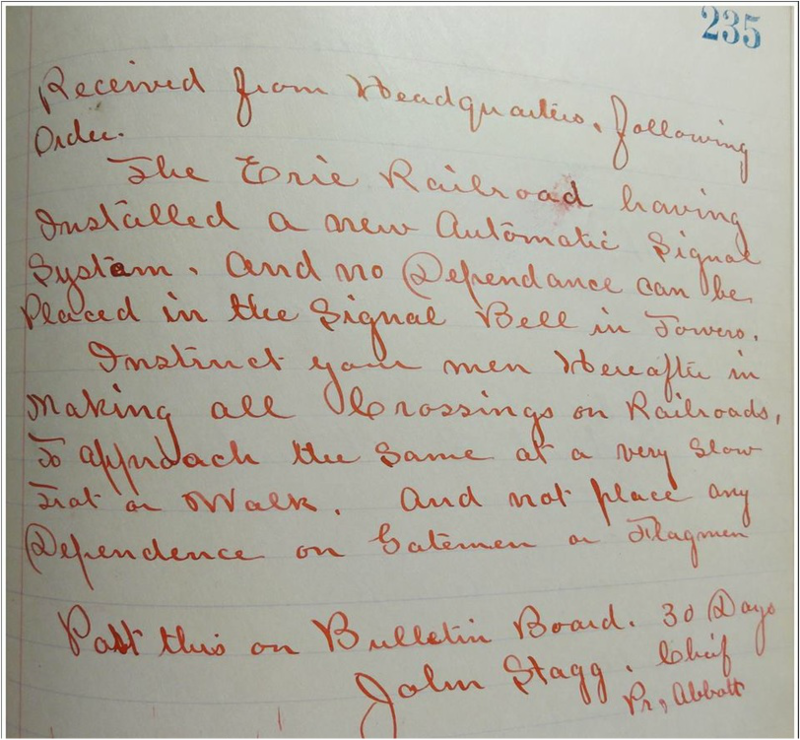 June 21, 1907: Order from Chief Stagg re caution upon crossing the Erie Railroad tracks: this comes from the Journal of Engine Company 8 on Wayne Avenue. 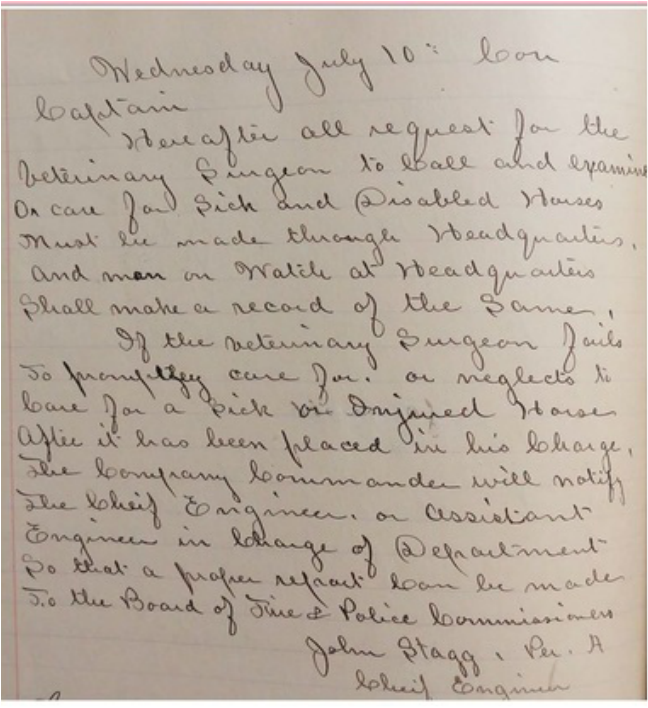 neglects to care for a sick or injured horse after it has been placed in his charge, the company commander will notify the Chief Engineer or Assistant Engineer in charge of department so that a proper report can be made to the Board of Police and Fire Commisioner. 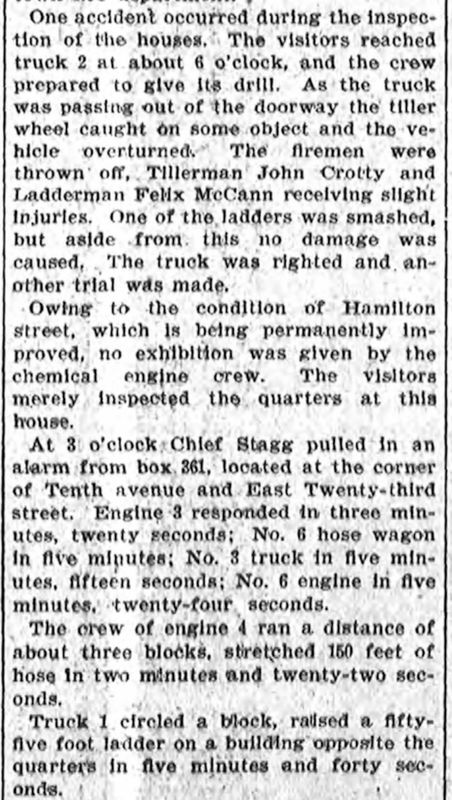 September, 1908: Engine Company 7 Silsby steamer is destroyed in a collision with an Erie train at a Getty Avenue crossing and fortunately no firemen were injured. 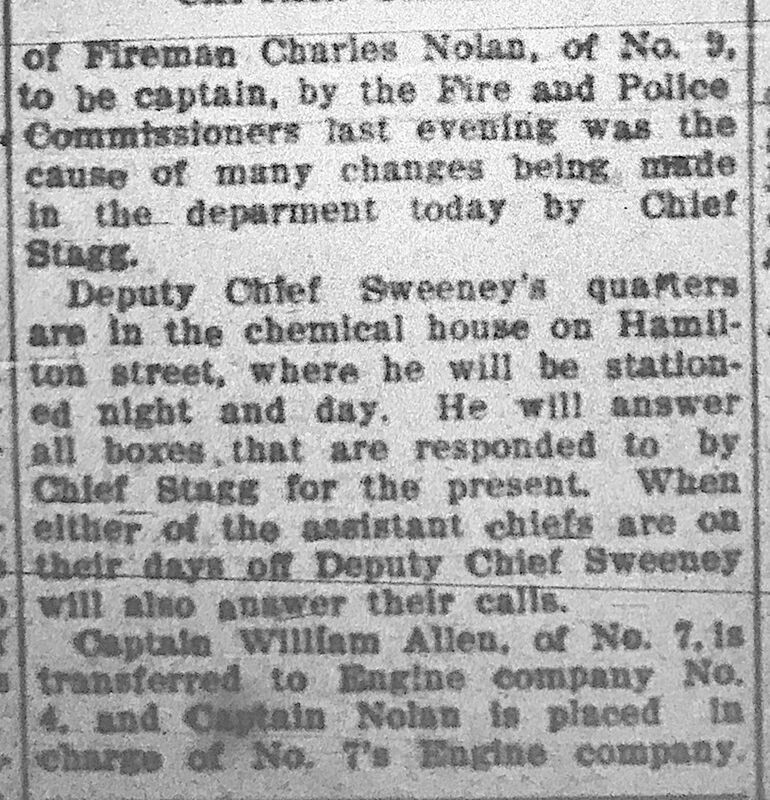 Chief Stagg reported it as one of the best fire engines. 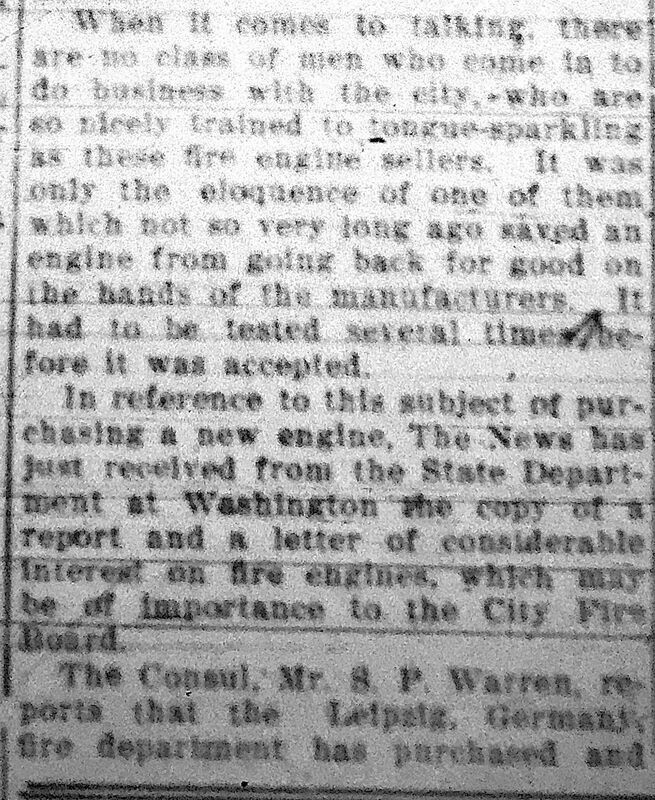 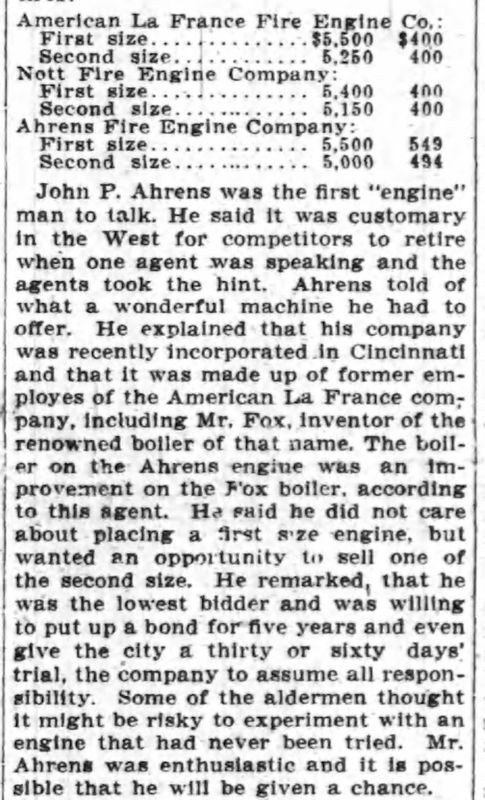 He advised that the city not invest in steam fire engines until the use of gasoline motors developed. 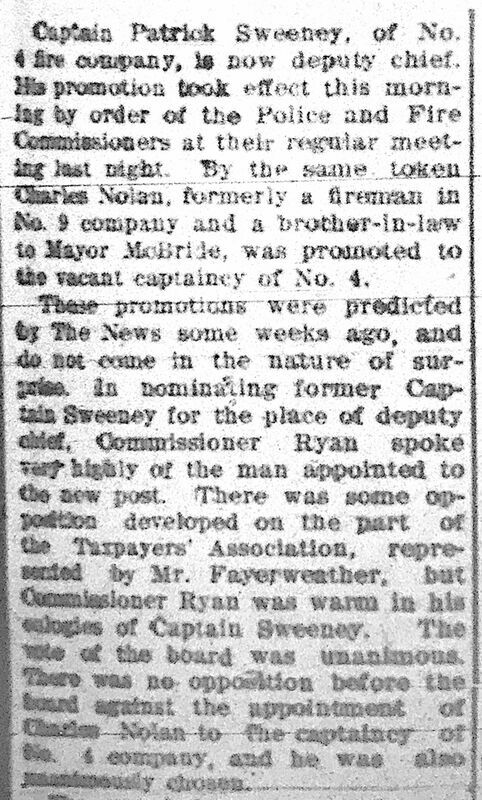 November 27, 1908: Death of veteran (original hire in 1890) and former Volunteer FF (of Neptune Engine Company 2) Charles Wiley. 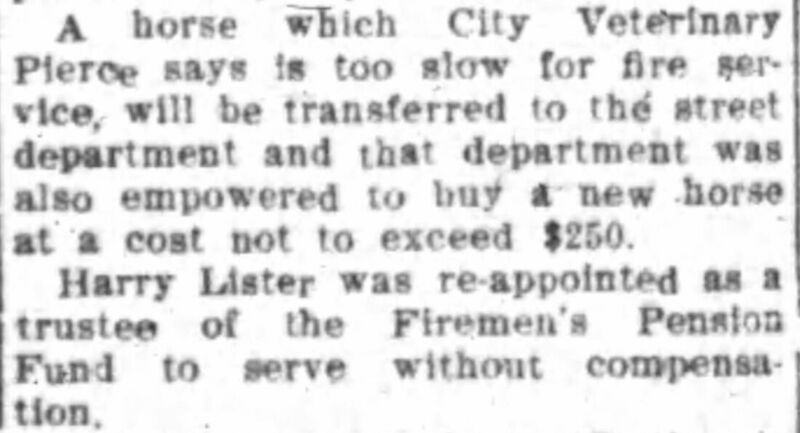 In total Wiley served department for 44 years (4 months short of 20 years on Paid PFD). 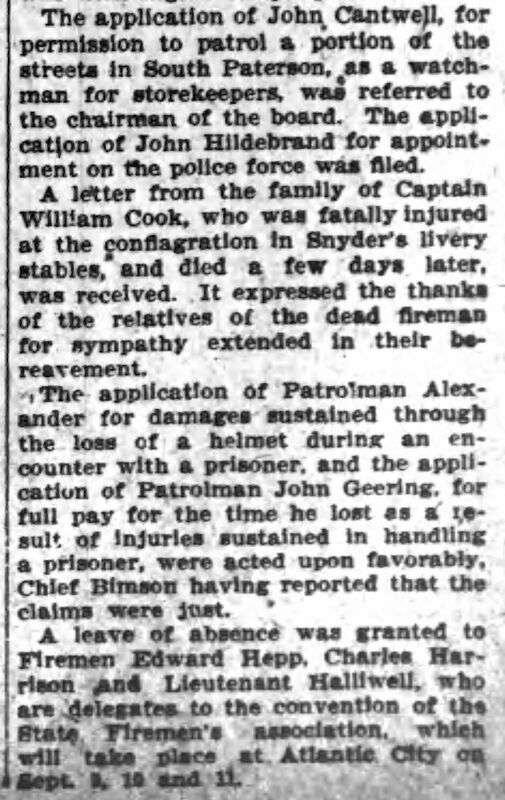 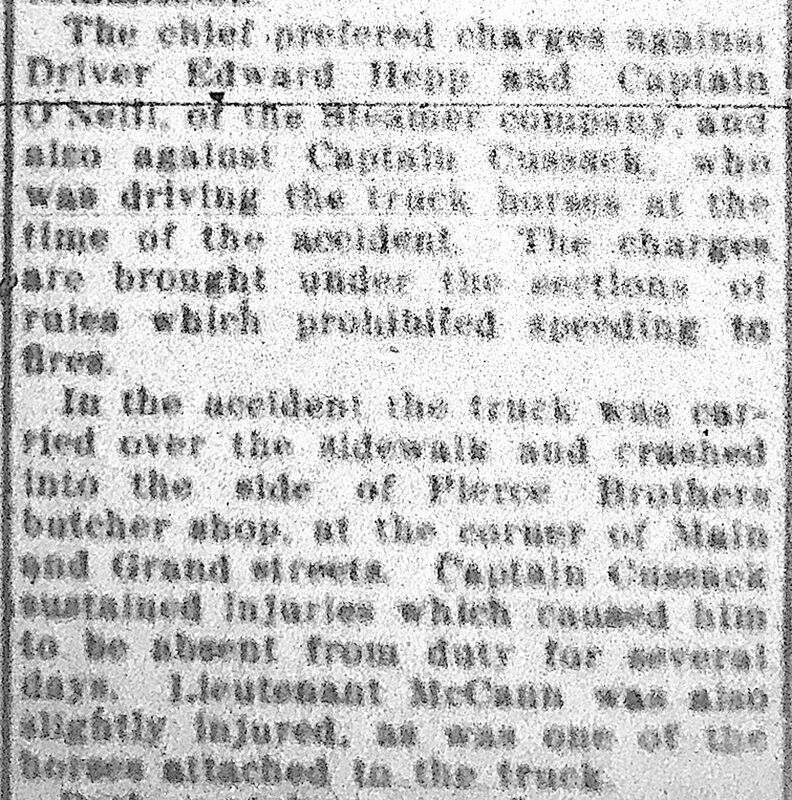 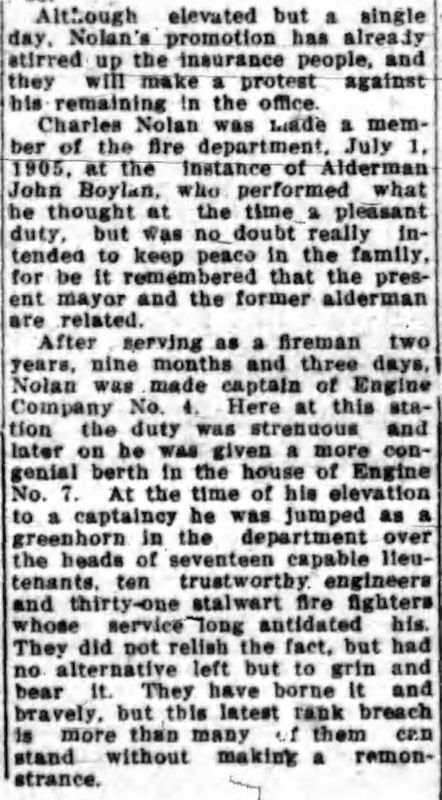 August 11, 1909: Captain William Cook (acting assistant chief) was fatally burned at a River Street stable fire. 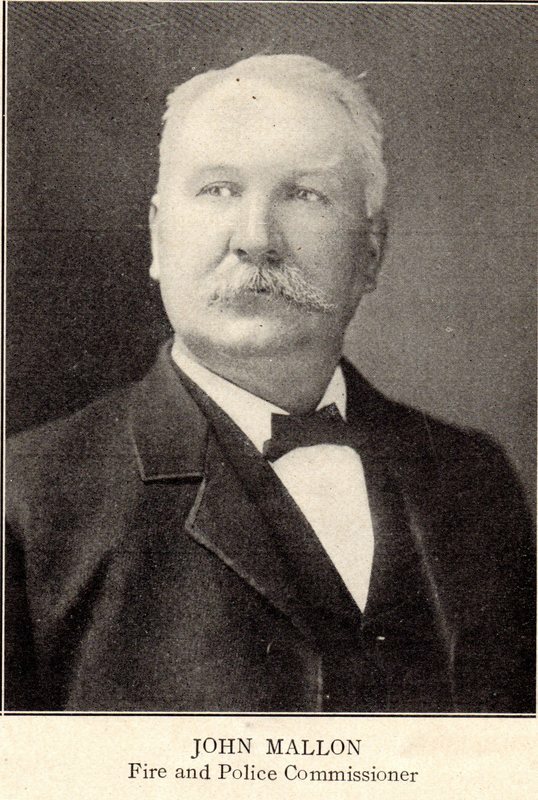 He died on August 14, 1909. 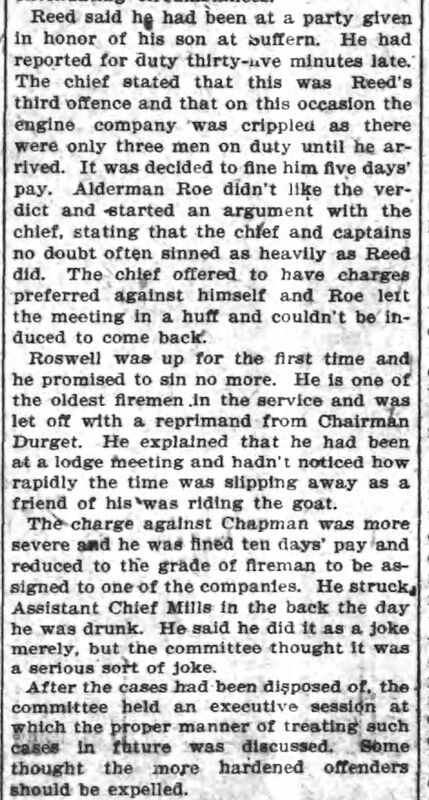 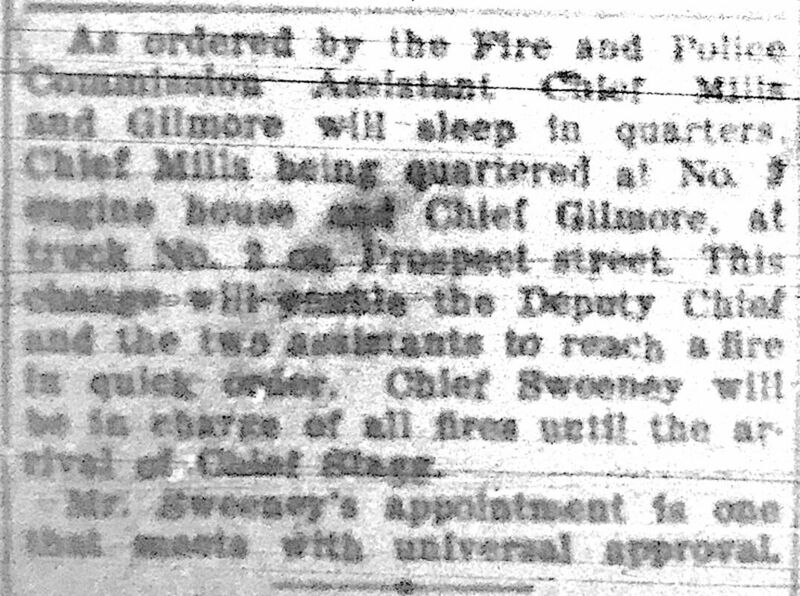 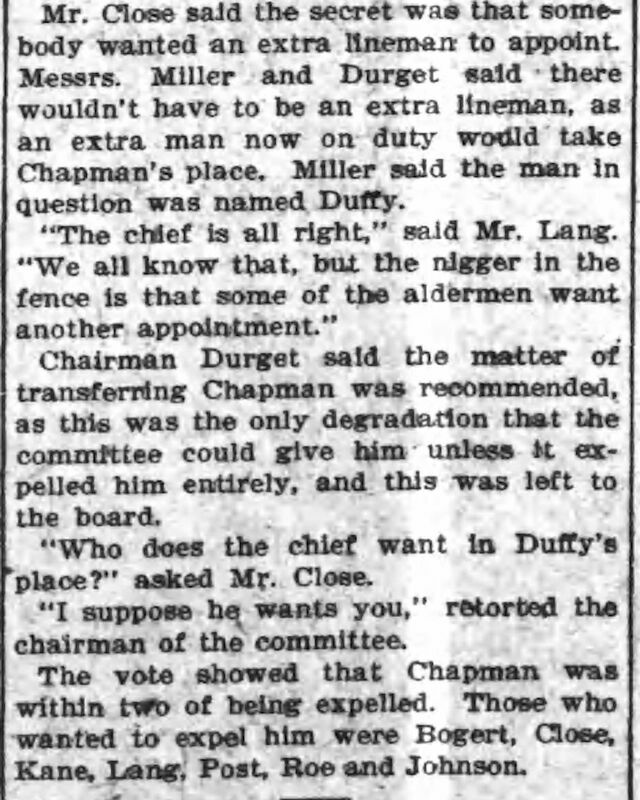 January 16, 1910: Retirement of Assistant Chief Mills set for August 1. 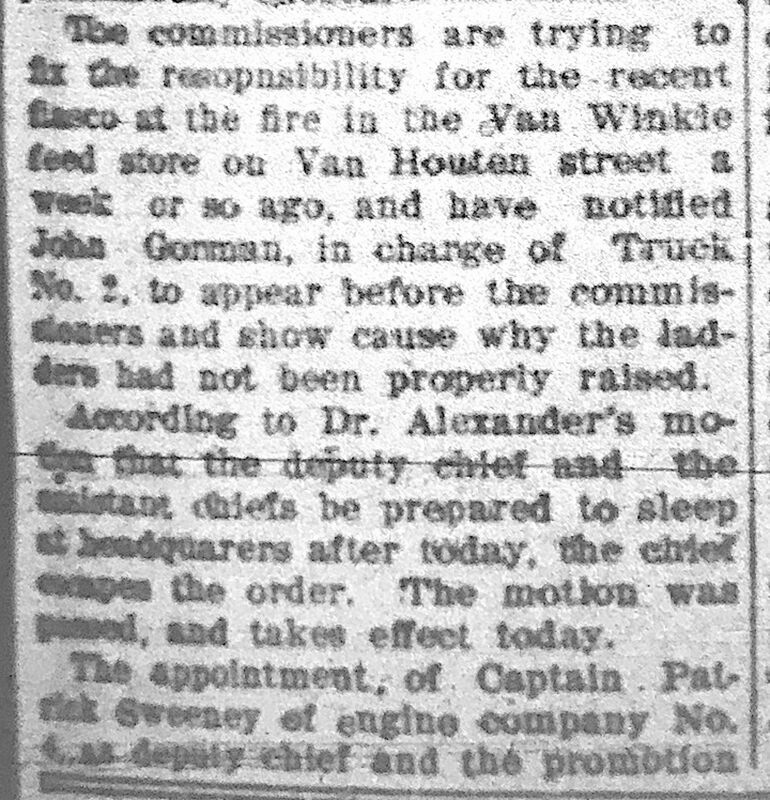 Vision deteriorating due to injuries suffered in the Great 1902 fire. 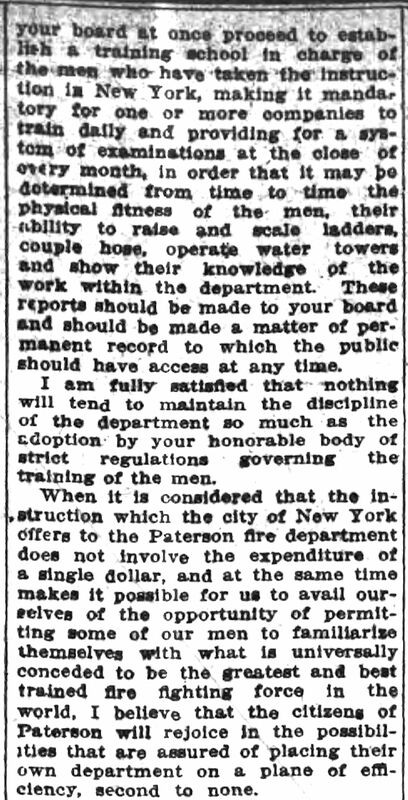 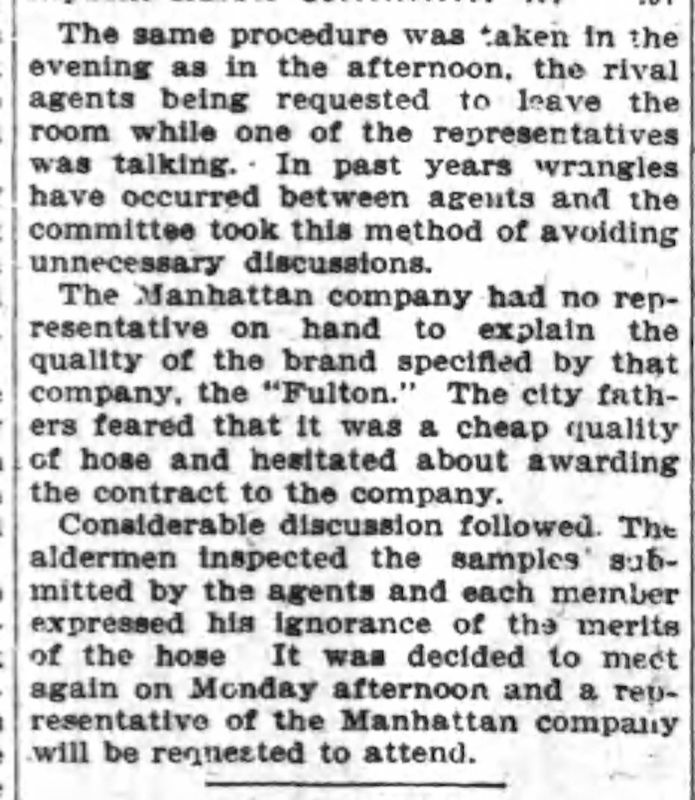 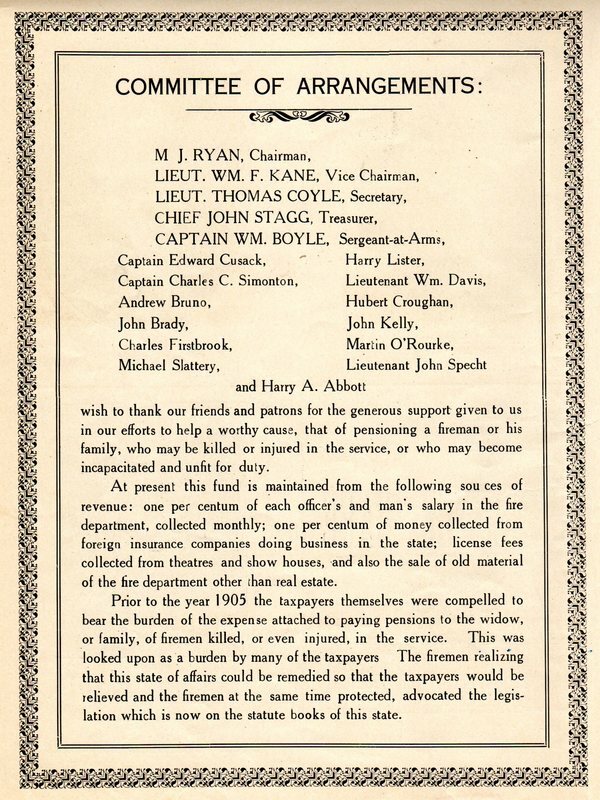 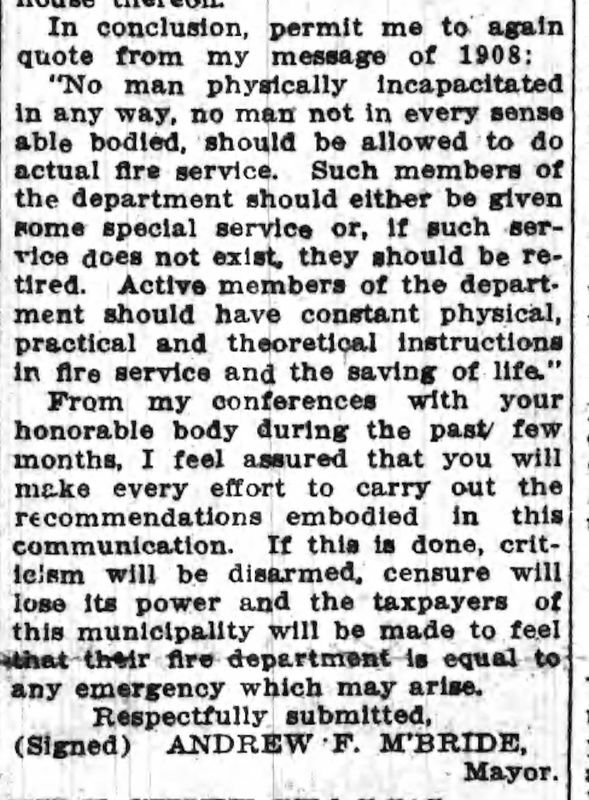 July 3, 1910: Merit Award for firemen proposed - - to be called the "Boyle Award." 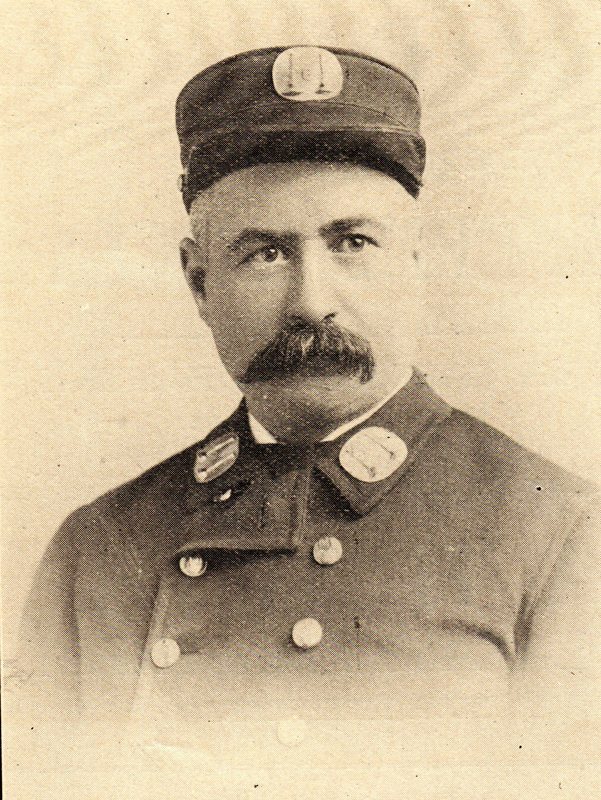 Chief Stagg to attend Fire Chief's Convention in Grand Rapids, MI. 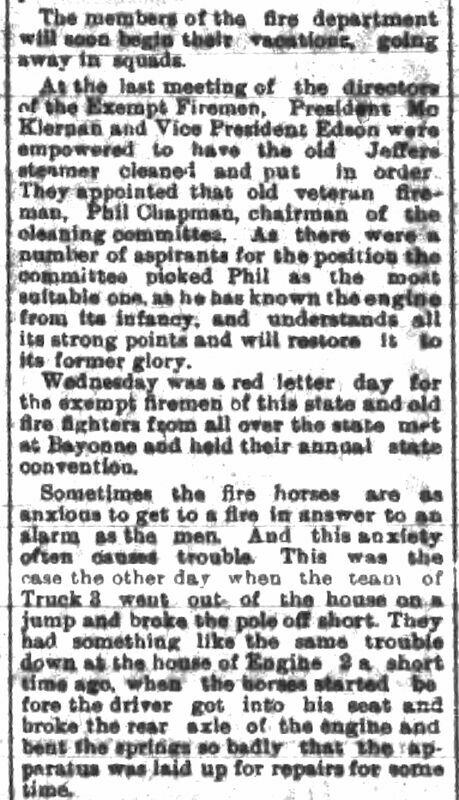 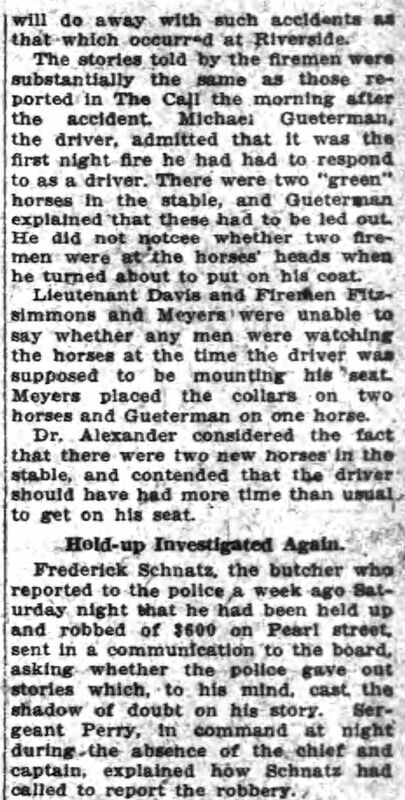 July 9, 1910: Chief Stagg issues apparatus driving directive - no faster than a trot! 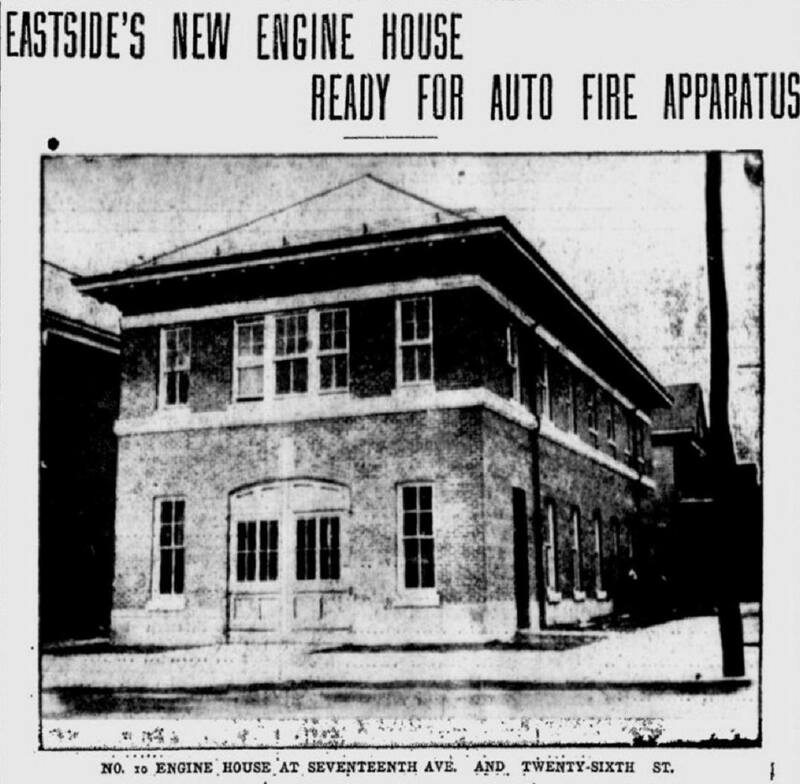 ​October 25, 1910: Engine Company 10 was established with the opening of a new firehouse at 198 17th Avenue at the corner of East 26th Street. 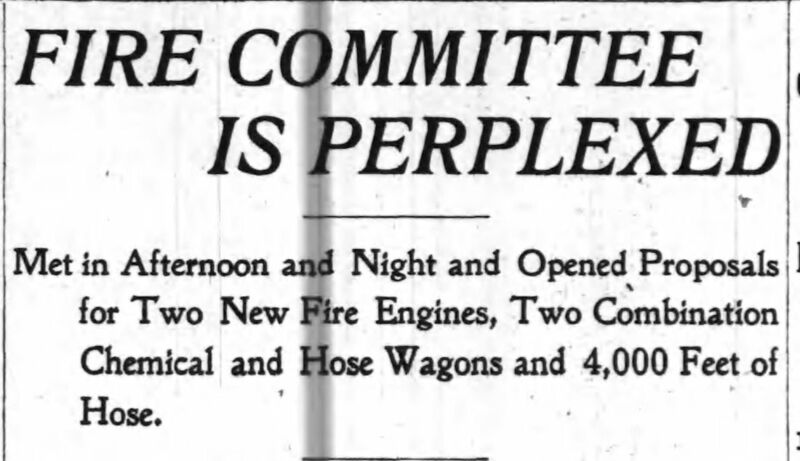 The departments fist motorized apparatus, a Howe Automobile Combination Fire Engine was put in service.